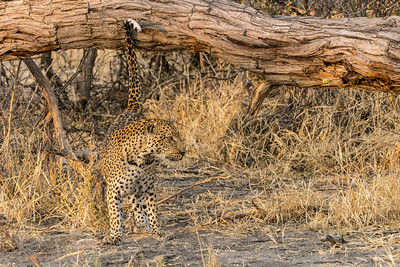 Leopard cub tackles an impala carcass pulled up on to the tree branch by his mom. 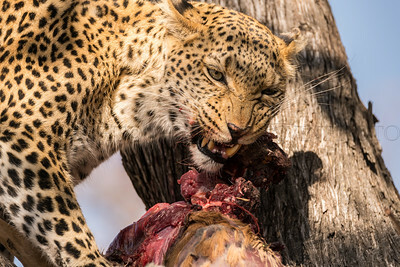 He has to eat it without it falling off the limb. Yellow Hornbill settling on an Acacia tree. 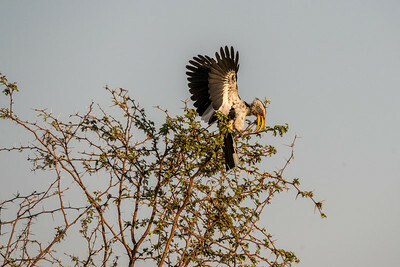 The Yellow Hornbill and the Acacia are both very evident in the Okavango. 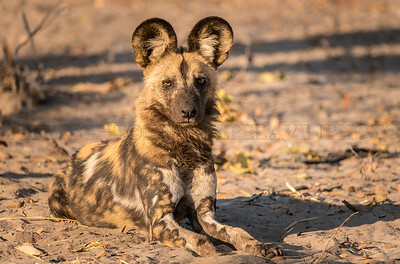 This Wild Dog is taking off and is actually moving rather quickly. 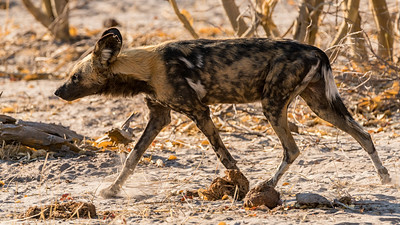 The African Wild Dog is built to run. 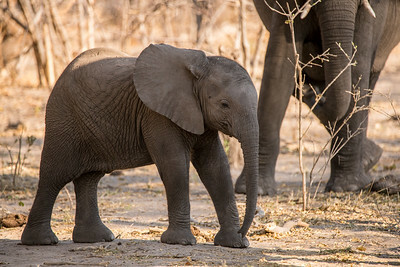 The baby fuzz is still visible on this little elephant. How can you not love this little one? The prides in this part of Botswana had fallen apart. 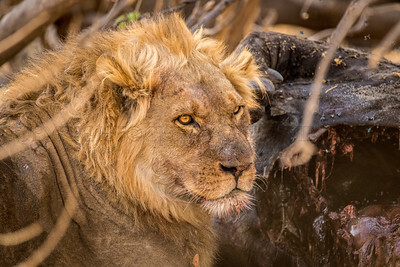 Maned males came over from Namibia, but did not stay. 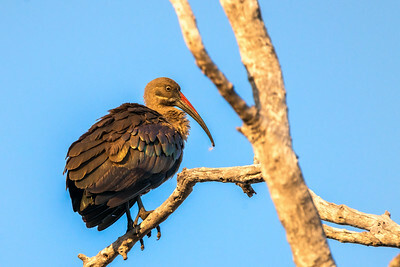 Our guide, familiar with these denizens, felt this female had been on her own for a long time. He pointed out her powerful and muscular build, bigger than the average female in a pride. 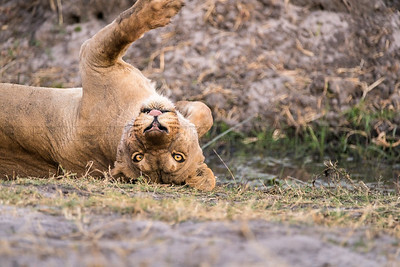 When we found her it was late afternoon, terribly hot and she was protecting her kill. 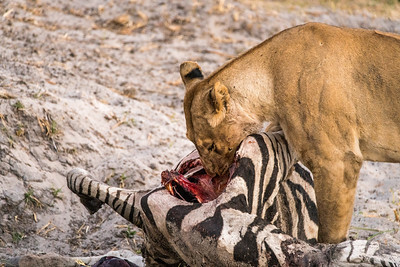 She had brought down a zebra and did not want the vultures to get it. As night fell she relaxed, cooled off, fooled around and actually ate. 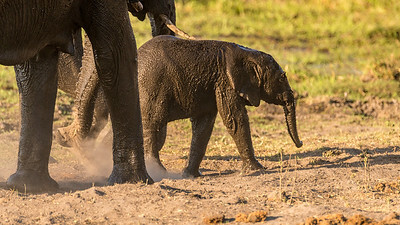 The very little elephant is hauling herself out of the mud puddle bath. Mom is already working on her dust bath. 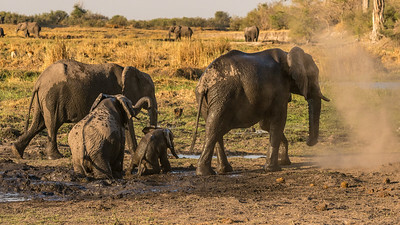 Elephant family moves on from the river. The tiny little baby has covered herself in mud. Her elders contue to blow and toss sand. Beautiful birds flit around the camp's food, but the people in charge are very strict and do not let them have people snacks. 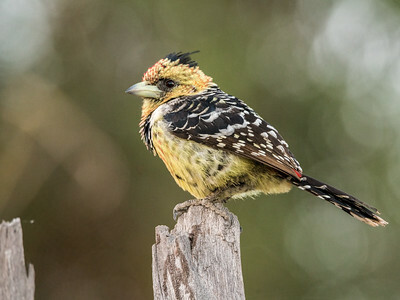 This is a feisty little bird. 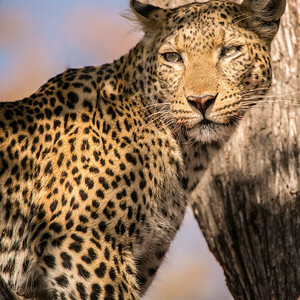 A shaft of sunlight lit up this powerful leopard. 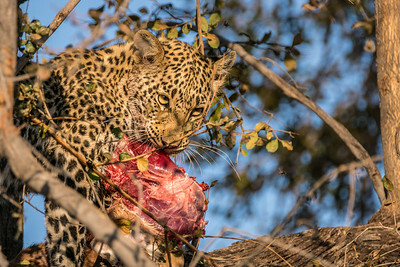 Leopards are stealthy and nocturnal, but we were lucky to see several of them in August. 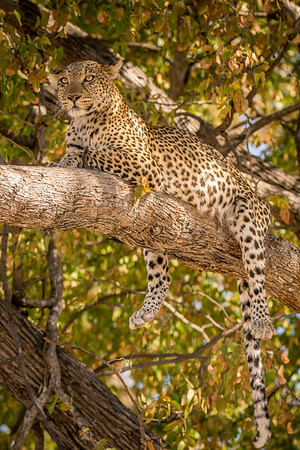 This is a typical leopard pose. How lucky we were to catch her so relaxed and in the light. 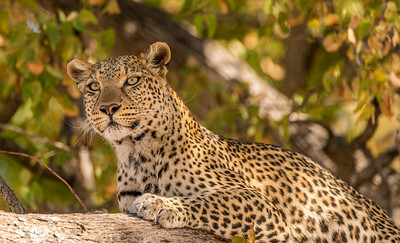 This is a typical leopard pose. She looks like her stomach is full and she is straddling the branch as if it was a cushioned bench. 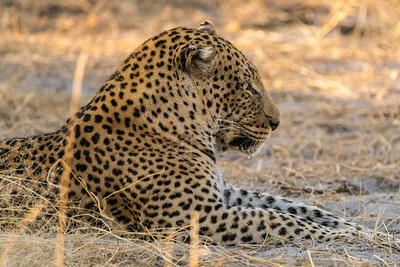 Leopards will sit like this for long periods looking left, center, right, keeping track of all activity. 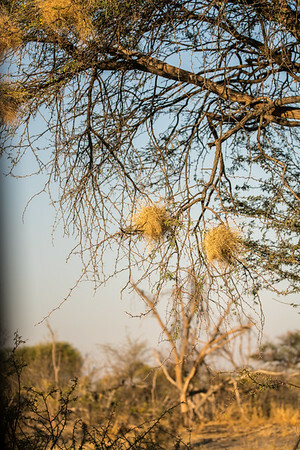 Amazing architects, the weaver bird nests are used not only for their own chicks but for other creatures once the weavers leave. 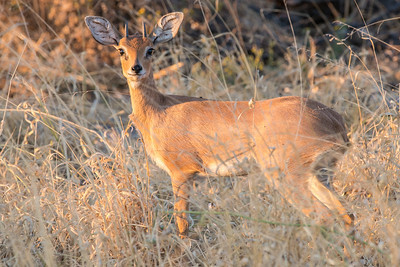 Steenbok, Steinbok or Steinbuck-this adorable little antelope is only 16" to 24" high at the shoulder. 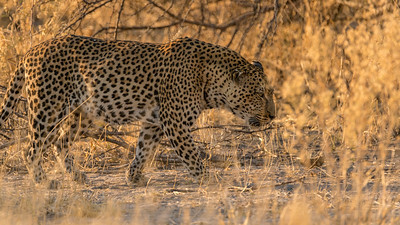 This big male leopard seemed to prefer to be just outside of camp. 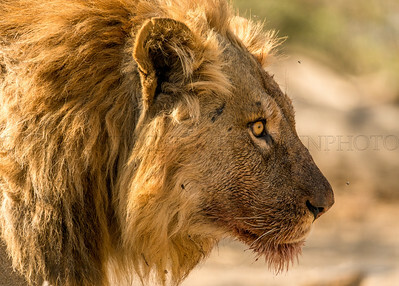 He was strolling and sniffing, scent marking as he went. 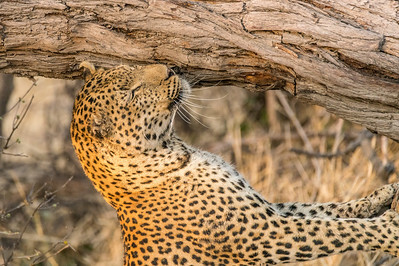 He is rubbing the scent glands on his cheeks and behind his whiskers on to the tree, just the way our little leopards do it at home. 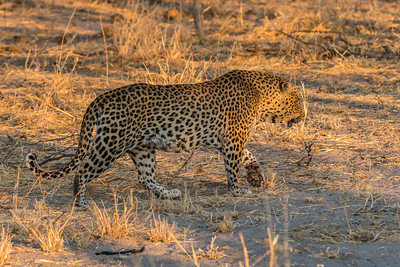 This male leopard was strolling, sniffing and scent marking as he went. I love that the image shows the amazing camouflage this cat has.